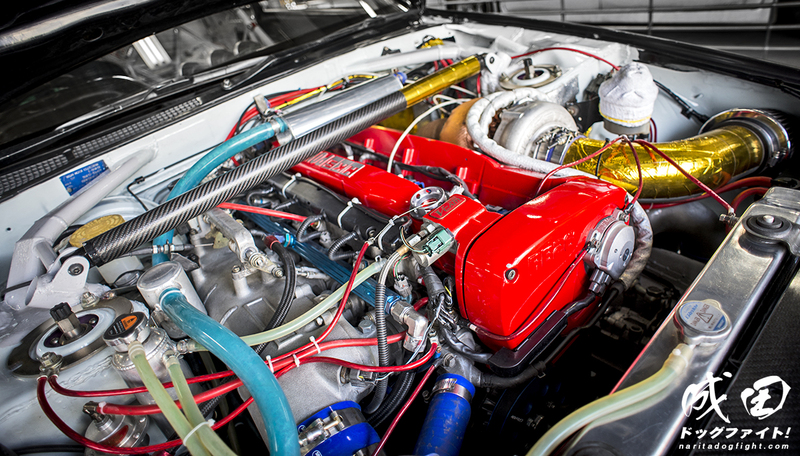 Hayashi-san, owner of Garage Saurus, has built his product with roots firmly in the drag racing circuit. It may surprise some then, if I were to tell you that for the past decade they have been just as familiar with road racing. It’s no secret that Saurus builds some of the highest powered Skylines worldwide, but it’s not often you see them on track. Not the case for this year’s HKS Premium Day at Fuji, as they had this very cool GT-R on hand gunning for the top time in the Option Fuji Super Lap battle. Not too keen on seeing Saurus built cars dressed in this much aero, although I suppose this one breaks the mold. 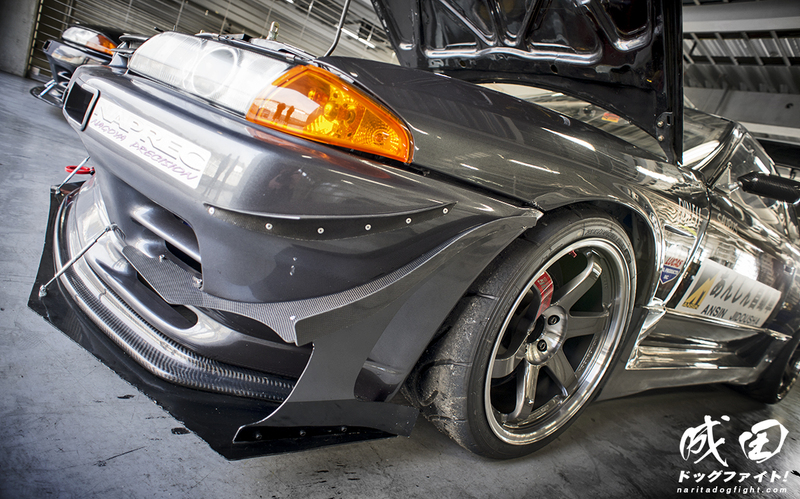 A very clean front end package is equipped to help achieve downforce throughout the course. To assist in the grip were the 4 295/30/18 A050 Advan tires that were so graciously wrapped around the 18x11j TE37SL’s at all corners. An Endless MONO6 brake kit took care of the stopping power up front, while an upgraded R34 rear brake setup sufficed for the back. A mild rear aero package made up of a carbon diffuser and GT wing provide additional downforce for the rear end. Saurus actually brought out 3 R32’s this day, but only this one particular one ended up putting down a time – you can see another one of the three in this shot. Occupying the once trunk area was an extremely intricate fuel delivery and oil management system. Extraordinarily remarkable craftsmanship; I stared at this for like 10 minutes. Best logo in Japan goes to…. 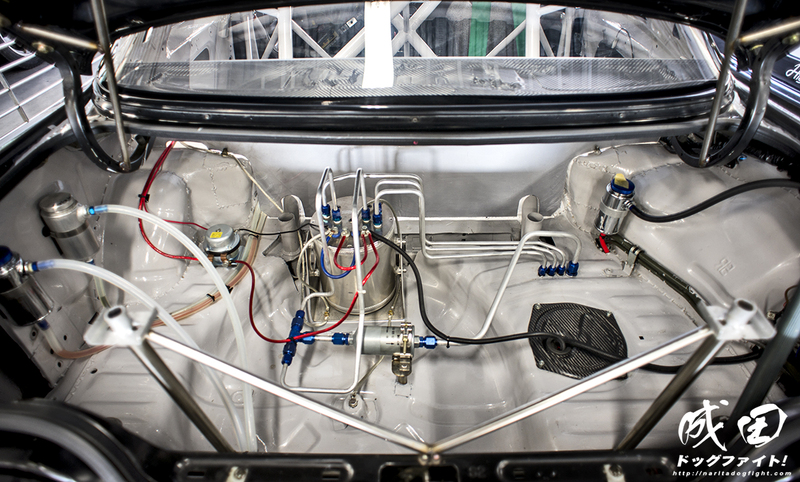 You can get a peek inside from this shot to see the extravagant roll cage that was welded in for extra safety and chassis rigidity. You can also see the carbon doors…. Powering the GT-R to reach speeds of 300 km/h on the front straight of Fuji is the now HKS supplied, 2.8 liter RB26 featuring all gold er’ythang. A T51R SPL ball bearing turbine, supporting parts and TRUST Intercooler give the RB a massive boost of power. An OS Giken rear differential, and a Cusco front differential make sure the power gets to the wheels. Pretty impressive display! I love how the shock tower supports are mated to the chassis via the roll cage and firewall. Aragosta coilovers with 14k front and 12k rear springs support the chassis around Fuji’s 16 corners, and make the car’s presence look really, really good. The end result? A fast lap of 1’49.053 – just shy of breaking into the 48’s. Not the fastest around Fuji, but still very quick! 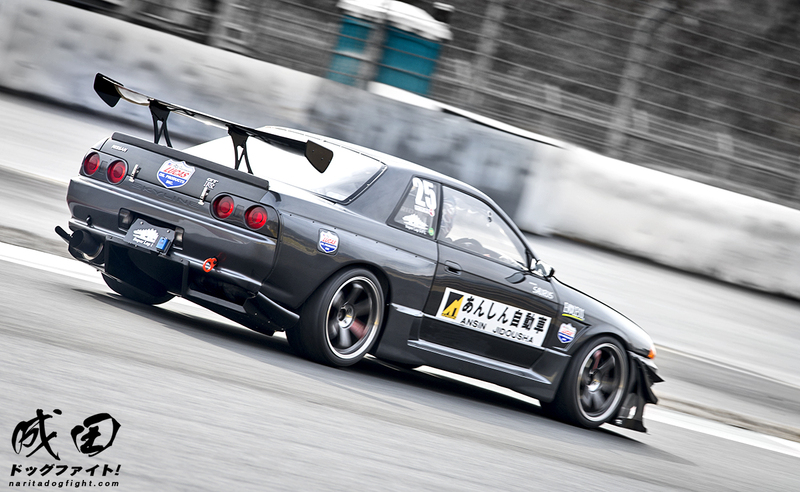 Good enough for taking the second fastest R32 of the day, behind the ATTKD 32 which pulled an blazingly fast 1’41.777 – a whole different level. I posted a video of this car on Instagram (@naritadogfight) – you should go check it out to hear what the turbine and wastegate sounded like when off throttle. 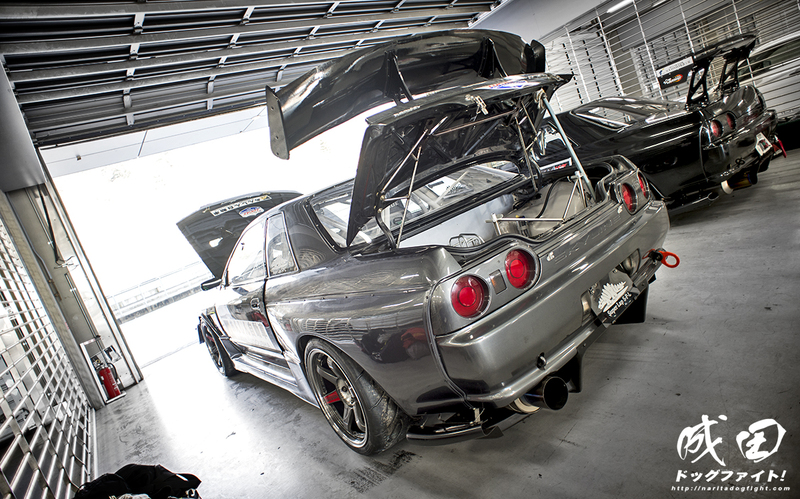 Great work by Garage Saurus SPL – very excited to see more time attack work from this legendary shop. You guys rules! Everyone wishes to see cars like this in person, you’re living the dream! hahaha Keep the great job!